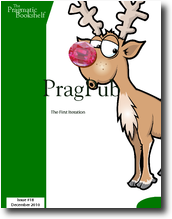 I’ve been a big fan of the Pragmatic Bookshelf series, in particular their monthly online magazine. The magazine are downloadable in PDF, .mobi, and .epub formats, and browsable online in HTML format. Browsing through the latest couple of issues, I noticed a distinct slowness as some of the images were downloaded. This is usually a hint that a high resolution image is being referenced, but being “cropped” down to a smaller size with the height/width attributes in the HTML. For example, see this story about Ruby Bundler and look at the red ribbon image. The source image is 693×693 but is being displayed as 190×190. It’s also a very high quality level and weighs in at 203KB – compare with the page itself which is only about 10KB. Resizing this JPEG image in PhotoShop dropped the size down to 6KB (or 3KB at medium quality), with no visible difference on the web page. Hopefully the above list gives a good roadmap for the improvements that can be made on a site like this. Most of this hopefully doesn’t require very significant changes to their build process, but should give dramatic improvements for site visitors.